The hardest part about running a business can be collecting payments for the job or service that you provided. When you have a detailed invoice to send out to your customers it can help. And it can help you to be consistent when it comes to listing the same rate for every new customer. As your customer become repeat business you can then apply a discount or give a lower rate. 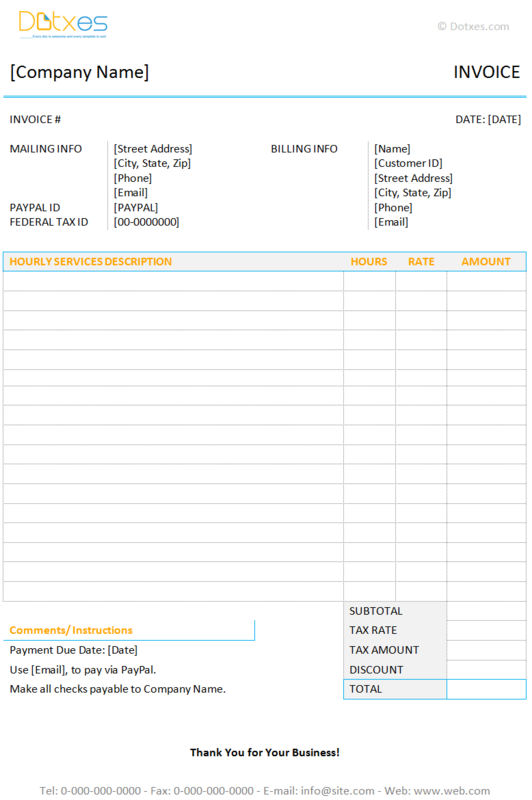 With the use of this Invoice Template with hours and rate through Dotxes, you get a fully usable invoice that is ready to go. All it takes is for you to fill in your business information and then fill in the information you need for your hours and rates. This can be done on the job, or in the invoice, with a separate bill sent to your customer at a later time. Be sure to add in your tax ID number as well as any sales tax that needs to be collected as a part of your billing. Handing your customer an invoice immediately upon completion of the job, and unless payment is received immediately, keep a copy for your records to call back on that customer if necessary. An invoice can act as a referral and by checking back with that customer later on you can provide a next level of customer service for them. An invoice allows you to keep track of everything about the service you provided, allowing you to know what was done, and where it was done at. Repeat business with the same customer or customers allows you to create better terms for them, and perhaps better pricing to earn more business later. The use of the same rate per new customers allows consistency between clients so they don’t think favoritism was involved. The invoice allows you to keep track of your workers in the field if they hand write in the numbers.